Hi everyone! I'm super happy to be back here on the SEI Lifestyle blog today, sharing another Berry Melody holiday project. Not only do I get the pleasure of hanging out with you all, but today just so happens to also be Thanksgiving AND my birthday! Yippee! I am ready to celebrate this day with a little fun! Every year around holiday time, I start searching for quick, easy, and inexpensive gift ideas for friends, neighbors, and co-workers. Seems I always have a long list of folks I'd like to remember with a little something without worrying about breaking the bank. Tag sets are one of my favorite go-to gifts for these situations. 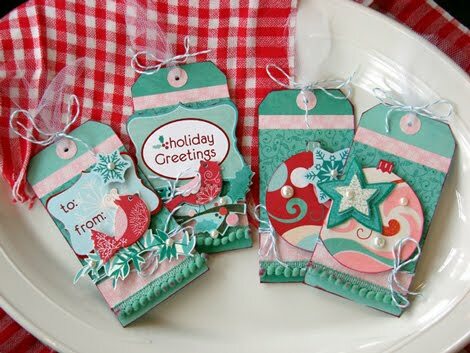 They don't cost a lot of money or take much time to make, and better yet, gift tags are useful for most everyone on your gift-giving list. And that's a definite plus with me. When making up sets of tags, I try to simplify the design process by creating the same basic background for each tag. Once I've chosen the papers, and arranged the layers, all the hard work is done. 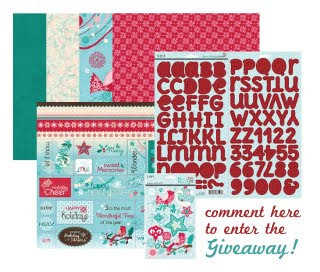 Just repeat the steps a few more times, and then have fun adding detail to each tag with die cuts, dimensional stickers, and elements cut directly from the patterned papers. 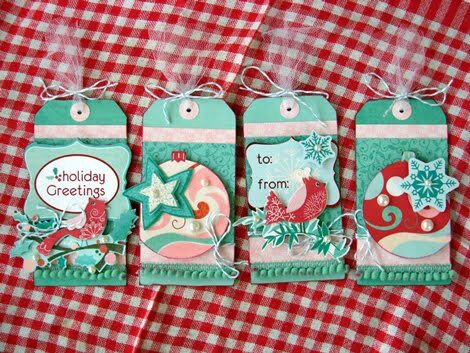 For my tags, I used two complementary shades of teal blue papers for the background, and layered each with panels of Shimmering Call and Frosty Peep papers. Added pom pom trim and wrapped the tags with baker's twine from the Sundries Kit. 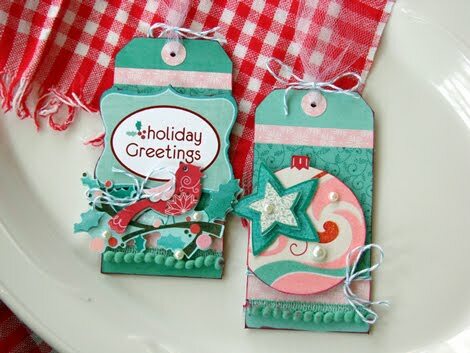 I cut some ornaments from the Sparkling Chitter paper for two of the tags, and decorated all with Berry Melody Dimensional Page Elements and Die Cut Accents. Pearls and tulle from the Sundries kit finish things off. Thanks so much for stopping by everyone, and wishing all of you in the United States a very happy Thanksgiving holiday! I'll be back tomorrow with one last guest post. This time, a happy birthday card using the adorable Field Notes collection. Hope to see you then! Pom Pom Trim: Pebbles, Inc. So cute..love the colors and that cute pompom too! Gorgeous tags!! Love this collection!!!!! Beautiful tags. Love the colors. I really love the rich colors of this collection and these tags really stand out. The pomp poms are so cute!! 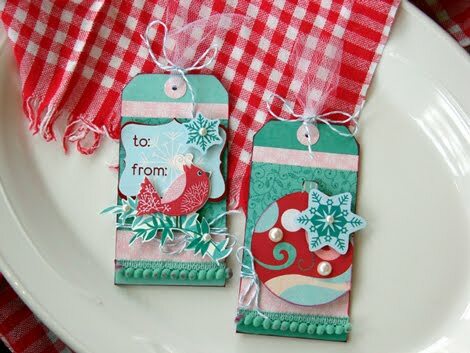 tags...I LOVE tags...such fun colors too!!! I love the non-traditional colors! Beautiful. SUPER cute, I would not even care about the present because the tag is so cute! Just ordered this paper collection! Thanks for the tags ideas! Such sweet and cute tags! Love them. Those tags are so cute. Love them. Hope you had had a very nice Thanksgiving and a great B-day. Beuatiful tags, I love all the little details! 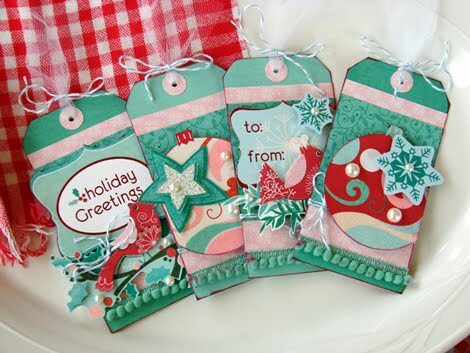 Love the tags - I am off to make some! So cute! I love the two with the little red birds! I collect cardinals for my Mom and love this color combo! 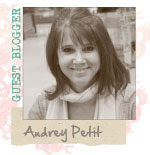 thanx for the inspiration and blog candy opp too!